JUMP INTO ACTION AND BECOME A FIGHTER ACE YOURSELF! YOU have to show what you’re made of as the war over Europe is in full swing. 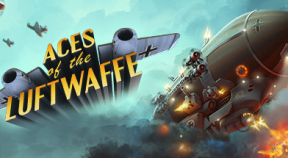 Fight waves of Axis planes and panzers until you hit the boss enemies – the ACES OF THE LUFTWAFFE. It is the darkest hour for England. The Axis are sending their best into the Battle of Britain, and only a handful of brave pilots are left to destroy them. Get into your war plane and don’t let go of the trigger before each and every enemy has been blown out of the skies! But even if you vanquish the notorious Aces of the Luftwaffe, are you prepared to take the fight to the mainland? Will YOU foil the occult plans of the Luftwaffe to spread darkness over England? Thank you for playing ‘Aces of the Luftwaffe’!